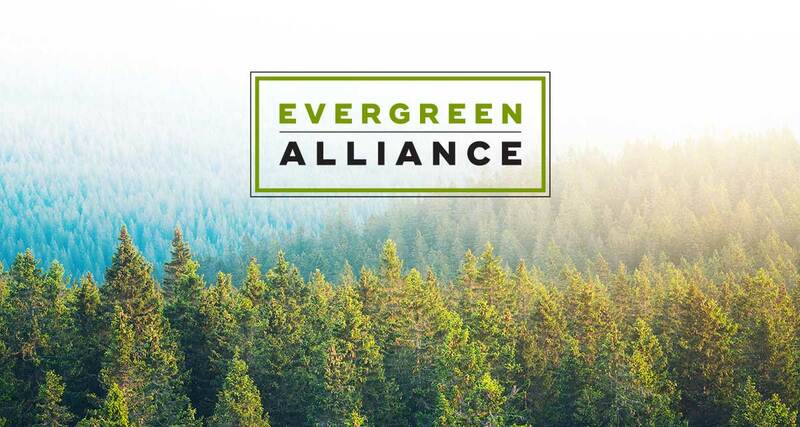 We would like to take a moment to recognize members of the Evergreen Alliance. This dedicated group of corporate partners has made a long-term commitment to helping us reach our goal of planting 100 million trees and inspiring 5 million tree planters by 2022. Bank of America is committed to helping support community resilience through green infrastructure in the cities and towns it serves. The company is partnering with the Arbor Day Foundation to create the Bank of America Community Resilience Grant program. This program is designed to amplify the impact of green infrastructure projects within low- and moderate-income neighborhoods, increasing green infrastructure in the areas that need it most. More than 3,500 Tree City USA communities across the country will have the opportunity to plant more trees in an effort to address critical issues including stormwater management, urban heat island effect, air quality, carbon sequestration, energy use, crime and social cohesion, public health, and tree canopy equity. A deep commitment to conservation and love of the great outdoors made a partnership with the Arbor Day Foundation a natural fit for Bass Pro Shops and Cabela’s. Each year since 2016, the company has planted 50,000 trees in its footprint — with an emphasis on forest restoration to provide critical wildlife habitat. These reforestation efforts also help to improve air quality and reduce runoff in watersheds, benefitting the local wildlife. Together, we are preserving the future of our forests for the next generation of outdoor enthusiasts. As manager of the share and reuse of more than 350 million pallets, crates, and containers throughout a variety of industries, CHEP and Brambles (CHEP’s parent company) are committed to sustainability. They are also committed to supporting reforestation efforts. This partnership supported the planting of 65,000 trees in 2018. The company heavily depends on certified wood to create and repair its pallets. Therefore, further replenishing the natural systems its core business relies on is a top sustainability priority. The bottomland hardwood ecosystem of the Mississippi River Valley is one of the most important critical wetland resources in North America. These efforts will directly improve water quality by preventing sediment and pollutants from washing into the Mississippi River and Gulf of Mexico — bringing life back to this region. With a high priority on operating in a responsible and respectful manner, Church & Dwight maintains six pillars of sustainability, including the Environment. In partnership with the Arbor Day Foundation, Church & Dwight is minimizing the impact of its global operations through offsetting carbon emissions with trees. On the path to become a carbon-neutral company by 2025, the growing organization’s energy efficiency efforts needed to be complemented by offsetting emissions through renewable energy credits and forestry carbon credits. Offsetting carbon through the Arbor Day Foundation connected deeply to Church & Dwight’s heritage of supporting wildlife conservations efforts. Each year since 2016, Church & Dwight has been able to confirm a larger percentage of their emissions as offset. In addition to the absorption of carbon dioxide from the atmosphere, trees planted by the Arbor Day Foundation provide improved water quality, erosion and flood control, and valuable habitat for a diverse range of wild species. Exelon delivers electricity and natural gas to 10 million customers through its six utility companies. Exelon strives to improve the quality of the environment and beautify the communities they serve. Through the Arbor Day Foundation’s Energy-Saving Trees program, Exelon has distributed more than 100,000 free trees to homeowners in Delaware, the District of Columbia, Maryland, New Jersey, Illinois, and Pennsylvania over the last eight years. Trees are offered to customers through an interactive online tool that educates them on where to plant the tree for maximum energy, air, water, and carbon benefits. These 100,000 trees are projected to bring $65,000,000 in environmental benefits to the communities Exelon serves. FedEx is dedicated to providing support for communities that have been devastated by natural disasters, with a commitment to meet residents’ immediate humanitarian needs as well as their long-term emotional recovery needs. As a part of its FedEx Cares Delivering for Good initiative, FedEx has been the Signature Program Sponsor for the Community Tree Recovery program for more than six years. They have helped facilitate the planting and distribution of more than 5 million trees to tens of thousands of residents who desperately needed them. Consistently ranked among the world’s most admired and trusted employers, FedEx engages its team members in local tree planting and distribution events across the United States. FedEx has committed to continue and accelerate their support of the Community Tree Recovery program, as well as their employee engagement opportunities, through 2022. Their goal is to bring further hope and healing through trees to those who need it most. As one of America’s first companies built with purpose, The Hershey Company has always focused on doing well by doing good. Milton Hershey himself believed “there is not a person alive who should not plant a tree…for those who are coming after.” Through its partnership with the Arbor Day Foundation, Hershey is committed to protecting the planet’s forests and natural ecosystems through concentrated reforestation efforts. In 2017, that partnership resulted in the planting of 130,000 trees. And in 2018, more than 150,000 trees were planted as a result of Hershey’s commitment to a shared planet and a Shared Goodness Promise. International Paper understands the need for support following natural disasters. As a leading global producer of renewable fiber-based packaging, pulp, and paper, their business depends on the sustainability of forests. International Paper is collaborating with the Arbor Day Foundation as a lead sponsor of the Community Tree Recovery program, which provides trees to homeowners following disasters that have had a significant impact on the local quality of life and tree canopy. They have also committed to support reforestation efforts in the forestlands surrounding these communities, as these forests are a critical piece of environmental recovery following disasters. International Paper inspires its employees to get involved in these recovery efforts and provides volunteer opportunities for them to engage with the communities in which they live and work. These efforts will help facilitate the planting and distribution of more than 30,000 trees in 2019. Guided by its sustainability & social impact platform, Serve 360: Doing Good in Every Direction, Marriott International is committed to making a positive and sustainable impact wherever it does business. In support of Serve 360 and its 2025 sustainability & social impact goals, the company promotes and invests in natural capital initiatives. As part of these efforts, Marriott partners with the Arbor Day Foundation in its Make A Green Choice program to increase reforestation and enhance the resiliency of forests across the United States. As an organization, Mary Kay is doing its part to sustain the Earth for future generations by partnering with organizations working to preserve and beautify our communities on a global scale. In ten years of collaboration with the Arbor Day Foundation, the company has planted 1,000,000 trees across the United States — with more than 500,000 planted in response to wildfires that devastated Bastrop State Park in Texas. Beyond this critical reforestation work, Mary Kay sponsored the development of 20 Nature Classrooms to immerse more than 31,000 children in nature. Recognizing that communities benefit from the environmental impacts of trees and that people benefit from the healing aspects of nature, Mary Kay has built a deep relationship with the Arbor Day Foundation to fulfill its commitment to Pink Doing Green℠. Oncor is a regulated electric transmission/distribution provider with 10 million customers across Texas dedicated to rethinking energy use for greater efficiency, cost savings and positive environmental impact. The company has built a reputation for caring about the environment and the communities they serve. Oncor is entering its seventh year of partnership through the Arbor Day Foundation’s Energy-Saving Trees program. They have distributed more than 50,000 free trees to customers through an interactive online tool that educates them on where to plant the tree for maximum energy savings. These trees are projected to save more than 100 million kWh over the next 20 years — equivalent to taking nearly 10,000 homes off the grid for an entire year. The focus of this partnership is to provide free trees while educating homeowners on strategic tree planting. Oncor will be offering more than 8,000 free trees to their customers in 2019. With a firm belief in Responsible Business Leadership, PwC is committed to acting on climate change, which affects our business, clients, and people — and disproportionately impacts those in underserved communities. In collaboration with the Arbor Day Foundation, PwC is helping to reduce carbon emissions by retiring verified forestry carbon credits. Healthier ecosystems improve the well-being of communities today and lay the foundation for healthier tomorrows. Target is committed to helping to create vibrant — and green — communities in which their guests and team members live. In partnership with the Arbor Day Foundation, Target will host eight individual tree planting events throughout the United States focused on creating and enhancing greenspace within neighborhoods. Target volunteers will plant hundreds of trees in these cities and towns that will help provide shade, clean air, and a stronger sense of community for years to come. For more than a decade, TD Bank has been committed to helping elevate the quality of the environment so people and economies can thrive. Through its TD Tree Days program, TD employees, community volunteers, local organizations, and Indigenous communities have teamed up to plant thousands of trees. Since 2010, they have helped plant more than 400,000 trees in communities across the U.S. and Canada. Additionally, since 2012, TD Bank has championed a grant program to support innovative community forestry practices by engaging thousands of community members and planting nearly 5,000 additional trees in low- to moderate-income areas in the United States. In the coming years — in partnership with the Arbor Day Foundation — TD Bank will continue this environmental focus, working to increase access to greenspace and creating vibrant communities through greening projects that build community and encourage long-term stewardship of trees. This work builds on the bank's corporate citizenship platform, The Ready Commitment, helping to bring to life its commitment to open doors for a more inclusive and sustainable tomorrow. As part of its Global Forestry Initiative, UPS® has partnered with the Arbor Day Foundation in tree planting efforts around the world. Since 2008, UPS has supported the planting and distribution of more than 655,000 trees throughout the United States, Canada, and other international areas. UPS is also dedicated to engaging their employees to roll up their sleeves and join in these efforts to help preserve the Earth’s forests, contributing to a healthier global environment for this and future generations to enjoy. In addition, trees are provided to UPS employees at events as well, so participants can plant them directly on their own property. This ensures the benefits of trees will reach UPS employees within their own communities. An organization dedicated to environmental stewardship, Verizon has been a strong partner of the Arbor Day Foundation in both broadscale reforestation and Community Tree Recovery efforts following hurricane devastation. By 2030, Verizon plans to plant 2 million trees in communities around the world, and nearly 200,000 have been planted in the last few years through the Arbor Day Foundation alone. In year two of a five-year hurricane recovery commitment, Verizon will again be planting and distributing more than 50,000 trees as a symbol of healing for those still recovering from the 2017 hurricane season as well as the 2018 hurricanes, Florence and Michael. With a focus on sustainability, Wyndham Destinations is dedicated to creating a better world for future generations. They have supported Arbor Day Foundation programs for more than a decade, leveraging trees as a means to provide economic and environmental benefits across the U.S. and around the world. By serving shade-grown Arbor Day Coffee®, Wyndham Destinations is preserving precious rain forest land. They have also supported tree planting in the Mississippi River Valley to rebuild vital wildlife habitat, directly improve water quality, and sequester measurable amounts of carbon. To date, Wyndham Destinations has planted more than 1.5 million trees and served more than 2 million pounds of rain forest-preserving coffee. This 10-year partnership is a testament to their commitment to promoting a more sustainable way of living and working. 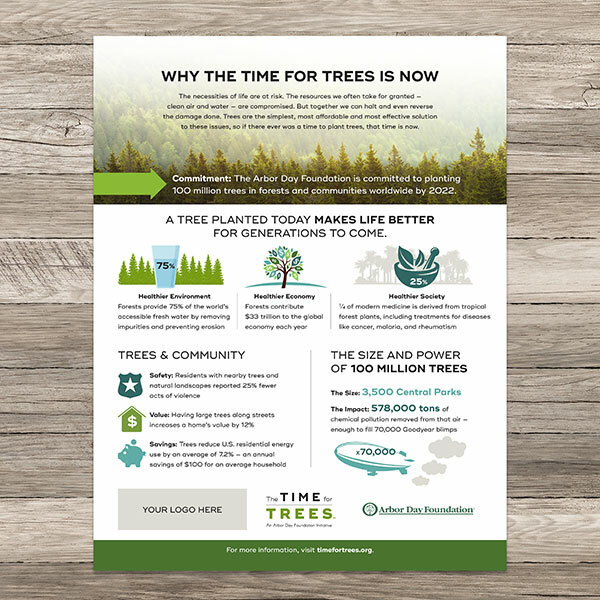 Find all the marketing materials you’ll need to promote your involvement in the Time for Trees initiative.